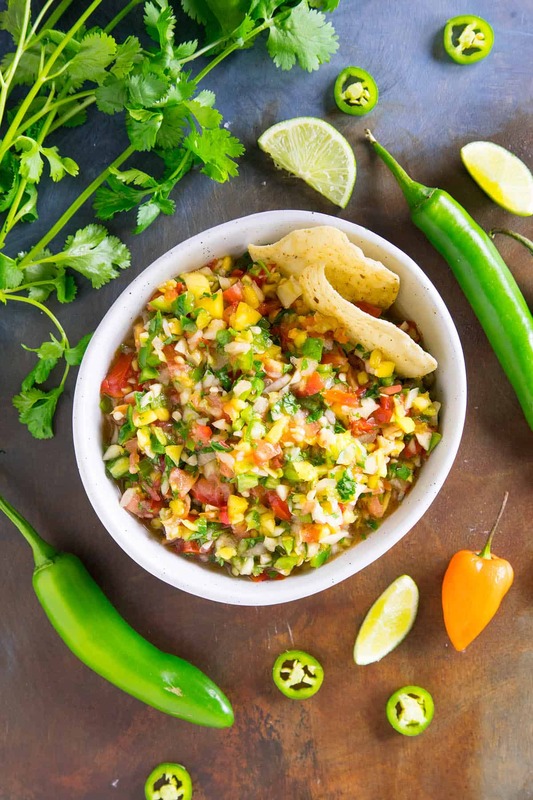 A spicy mango salsa recipe made with sweet mangos and fiery chili peppers, including jalapenos, serranos, and habaneros. It’s the perfect appetizer or party food, and you can easily adjust it to your own preferred heat and spice level. Great, also, for topping grilled meats. It’s Salsa Madness around the Chili Pepper Madness kitchen this week, right? 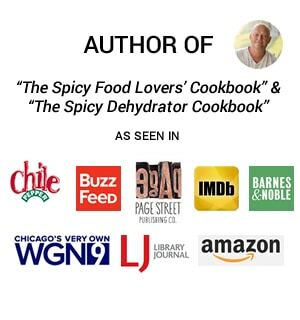 I just posted a new and AWESOME Habanero Salsa Recipe – totally in LOVE with that one – and you know? I just couldn’t get enough salsa! So I made this – Fresh MANGO salsa. BOOM! 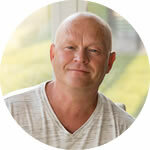 I had a couple of small mangoes in the refrigerator from just before I left for the Everything Food Conference in Salt Lake City this year – GREAT conference, btw – and when I returned, I realized I needed to use them up before they turned. I had a BUNCH of peppers in the fridge – SHOCKING, I know – along with fresh cilantro and figured, hey! I’m in the mood for salsa again! Why Should I Make Fresh Mango Salsa? The thing is, you don’t really NEED a reason to make salsa. It’s good pretty much any time of the day and pretty much any occasion. I enjoy it as a quick and easy snack. Bust out the chips, yo! 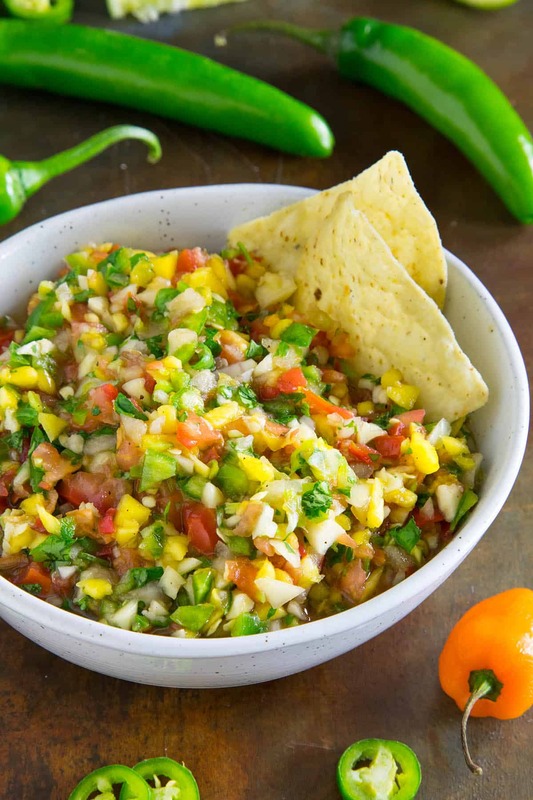 It’s ideal for any party situation, though, so if you have a game day celebration coming up, a birthday party, or any other reason for a get together, consider bringing this Fresh Mango Salsa so you can be the hit of the day. Especially with grilling season here. Break out the grills and get your mango salsa ready! Making it SERIOUSLY easy. It’s mostly just peeling and chopping! 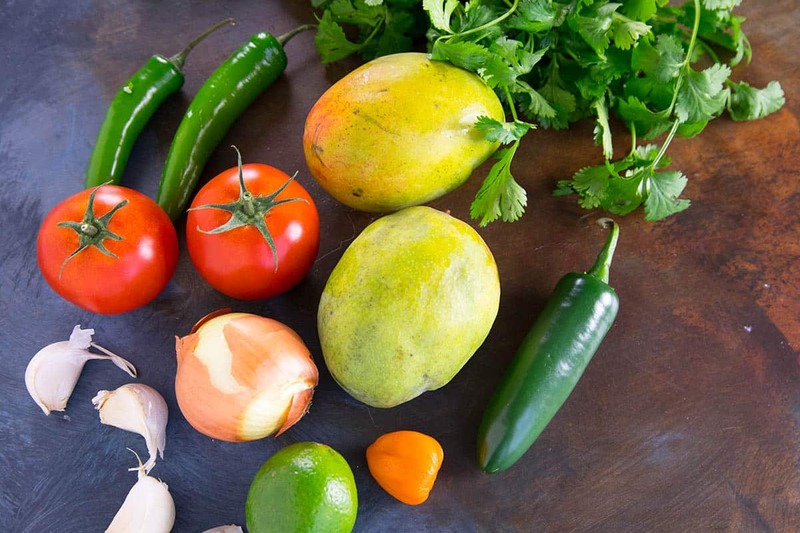 The first thing you’ll need to do is gather up your ingredients, including ripe mango, chili peppers, onion, tomatoes, garlic, cilantro, lime juice, red wine vinegar, and a bit of salt and pepper. Peel and chop the mango, then chop the peppers, onion, garlic and cilantro. All you need is a rough chop. Pop them into a blender or food processor with the rest of the ingredients and pulse the mix a few times until you get the consistency you desire. If you want a chunkier salsa, only pulse it a few times. Keep blending for a smoother salsa. Adjust it to your personal taste with a pinch of salt and pepper and serve it up! NOW — this is a VERY FRESH salsa. You’ll notice the heat of the peppers here, as well as the pungency of the fresh onion and garlic. As you already know, I LOVE my salsa nice and SPICY. I LOVE a good heat factor, so I chose to include 1 jalapeno pepper, 2 serrano peppers and 1 habanero pepper. You’ll definitely get some HEAT here. However, if you’d like to dial back the heat level, skip the habanero pepper. You can also reduce or skip the serranos, and go with jalapeno peppers only. You’ll still get a nice kick from them. Also, instead of serving right away, add the salsa to a sealed container and refrigerate overnight. The flavors will mingle and the overall FRESH BITE will mellow a bit. You’ll still get plenty of freshness. Diced avocado is a nice addition to this recipe. Optional! I’ve also tried it with black beans. Loved it! You can also mix in some fresh diced mango to make the salsa a bit chunkier if you’d like. Feel free! You want to bust out and serve with chips, right? So do I! I love crunchy tortilla chips with salsa. But! Consider serving a fresh salsa like this over grilled foods. It really adds a pop of heat and flavor to many a dish. Try it over grilled chicken or pork, or toss a few scoops with grilled shrimp. Try it out on tacos, too. Did I hear fish tacos? Yes! It’s the perfect topping! Can You Freeze Fresh Mango Salsa? Fresh mango salsa doesn’t freeze very well, unfortunately. Because the ingredients are fresh, they will become soft and soggy once they are thawed. It is better fresh. 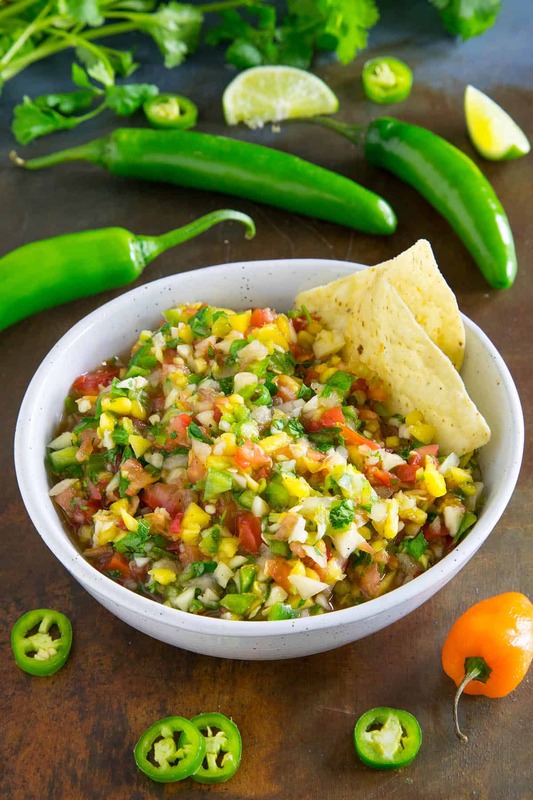 However, if you make the cooked version of this recipe – see my Fiery Mango Salsa Recipe – then YES, you can freeze it. I hope you enjoy it as much as I do! If you make this, take a pic, share it with the world! Please tag #ChiliPepperMadness. I’ll love you forever! 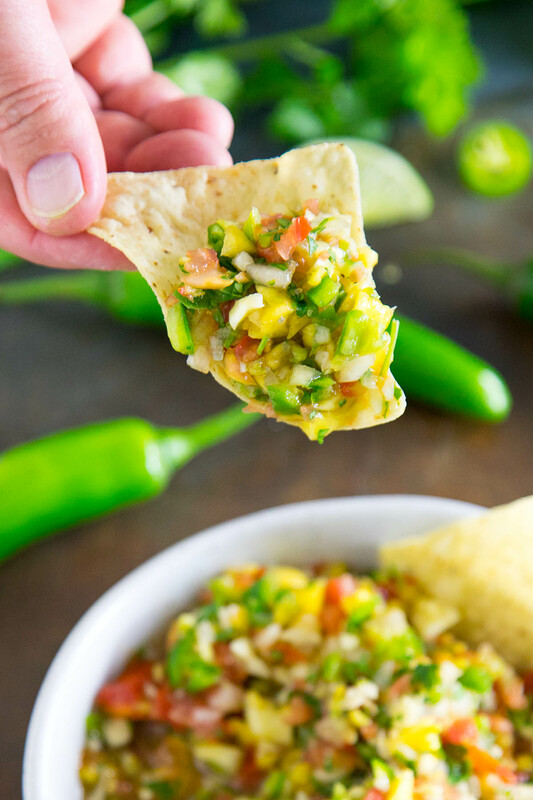 Check out our other Salsa Recipes, my salsa loving friends. Please comment and give it a review in the form below if you enjoy it! I’d love to hear from you. Thanks! 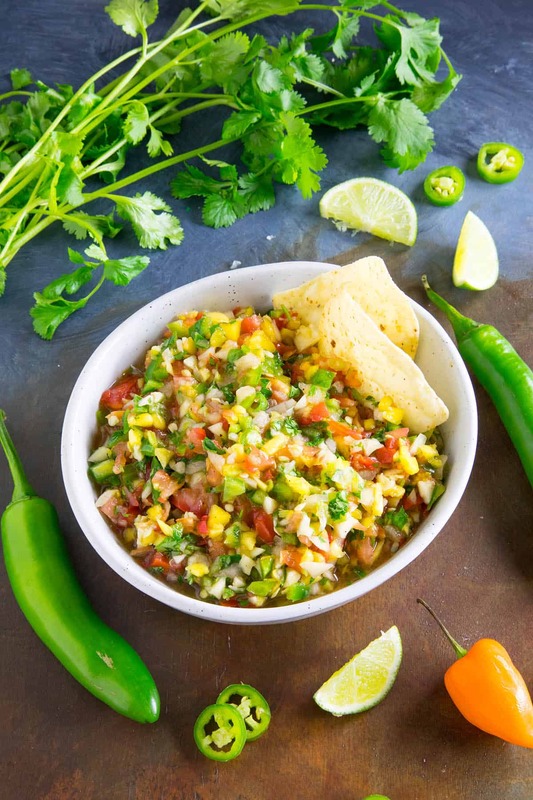 A spicy mango salsa recipe made with sweet mangos and fiery chili peppers, including jalapenos, serranos, and habaneros. 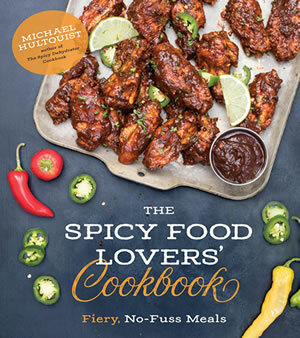 It's the perfect appetizer or party food, and you can easily adjust it to your own preferred heat and spice level. Great, also, for topping grilled meats. Add all of the ingredients to a food processor. Pulse the mixture several times until you achieve your desired consistency. Serve immediately for a more pungent flavor, or refrigerate in an airtight container overnight to let the flavors mingle and mellow a bit. Heat Factor: Hot. 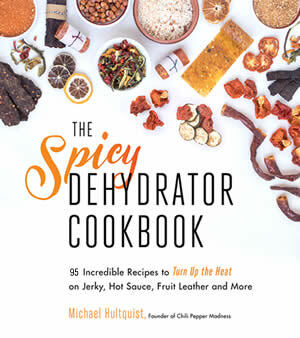 You can reduce the overall heat by omitting the habanero pepper. Like some EXTRA heat? Toss in an additional habanero. This salsa is gluten free. I made this for the Super Bowl this year and everyone raved about it. Such a great salsa recipe. Please keep up the excellent work, Chili Pepper Madness! Thank you, Damien! Glad they liked it! Excellent, thanks! Let me know how it turns out for you.